When you enter St Petersburg metro and take the stairs down, you enter a different world. The metro station system will welcome you like a grand tour through the Russian Palaces. Moreover, each station across the city of St Petersburg Metro has its own enchanting classical decoration depicts Russia’s past. Another famous Russian metro station is the beautiful metro stations in Moscow. During the Stalin era, communist blossom and they believe the palace with luxurious decoration should also be experienced by the people. Therefore, Stalin orders beautiful classical decoration such as art deco, chandeliers, statues among the countries metro stations. So you can see much stunning decoration along the way. St. Petersburg metro is the deepest metro stations in the world, below it is the Moscow metro stations. It consists of 65 stations, with about 50 stations in 30 meters depth under the ground. Russian metros function as metro stations as well as a bunker during the war. Due to its uneven landscapes, some station is designed much deeper than other stations. Admiralteyskaya metro is the deepest metro station in Russia with a depth of 102 meters. The St Petersburg metro has 6 lines with different colors to distinguish their time to establish. The first line is the oldest line which dated back to 1955. Moreover, is the only line in which there are 8 wagon trains. However, other four lines have 6 wagon trains. The logo of the St. Petersburg metro is a representative of “symbol of the collapsed tunnel”. This unique logo is an inspiration of how deep the stations are. Moreover, it also experiences St Petersburg geographical landscapes. St Peterburg ranks the 19th busiest metro stations in the world. It often experiences many overcrowded situations. There are many “Vyhino effect” incidences. A situation when the last station on the line gets so clogged full of people. Moreover, it is extremely difficult to find a seat for people entering the train at other stations. St. Petersburg metro is the second largest metro stations in Russia after the Moscow metro station system. The vast Russian areas need numerous stations in each city just to accommodate the transportation needs of its people. The first metro station with the horizontal door design. There are more than 10 St Petersburg metro with horizontal lift to accommodate the passengers. Moreover, “Technologicheskiy Institute” was the first Rusian metro station with a cross-platform transition. The geographical feature of St Petersburg many is deep underwater. There are 24 stations from the total 65 stations of the delta of the Neva River. Many stations exhibit artistic decorations. Such as an amazing painting of five rides in 4 horses in the “Ploshad Alexandra Nevskogo” metro stations. In addition, you can find amazing feature of “Avtovo” metro stations with only 16 of the 46 columns has a glass lining. many of the stations were among the first metro stations to use a lighting system which imitated daylight but was, later on, use ordinary electric lighting for a more reliable source of lights. Narvskaya and Kirovsky Zavod are a Soviet-themed station. There are reliefs of doctors, builders, farmers, sailors, and other highly regarded professions on the walls. The station also has a large mosaic of Stalin, which was covered up in 1961. There are many situations where the metro stations development experiences delay or stopped. “Avtovo” became the first St. Petersburg metro stations without escalators. It has unique decorated columns with glass ornamental glass. Moreover, it isn’t covered in glass than it is made of white marble. The overall look gives the station a very royal feeling. “Spasskaya” is the only subway station in St. Petersburg, which does not have a lobby yet. In addition, The St Petersburg metro has only one station, the “Dachnoe” metro station among the first station is closed for good. The metro stations run very fast. It takes like only 10 minutes from one station to another. It represents the saying “I missed my train” very well. The trains take about 90 km / h. 30 to travel. Most of the time, the trains are very punctual and reliable. The St Petersburg Metro is famous for its remarkable stations and long escalators and its payment systems. If you are living in St Petersburg then the special transport card suits you perfectly. However, for a one-time ride, you can obtain a token. Zheton coins cost about 45 rubles. It is available at the cashier desk or in machines in every metro station. The token looks like coins so make sure you didn’t get confused with the country coins. In the metro, you can change lines as many times as you like with one ticket. Moreover, the unused Zheton is valid all the time. If you are going to use the St Petersburg metro, purchase and always carry a map with you to familiarize the many route and transit stations. Most of the stations have long names and not easy to remember, Moreover many signs are written in Cyrillic, although some English words also stated above the Russin words. However, if you do get lost and need to find your way to the nearest entrance. You just need to follow the blue signs which read ‘way out.’ Sometimes maps and signs are the only things that you need to pay attention to explore the city. Visiting and sightseeing through St Petersburg metro is another reason to visit St Petersburg. 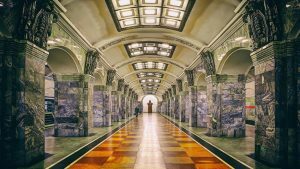 Their metro stations are the representative of three major eras in Russia History, the era of the palace during Stalin with beautiful luxurious ornament, The simpler metro after Stalin fall and the modern era. The metro also serves as a walking museum to its beautiful decoration and long hallway. Therefore anyone traveling by metro will need to walk a certain distance because they are far from the entrance point. You can troll these metros and observes the unique St Petersburg fashion styles while enjoying your walk and the sceneries.